28/8/08 — Acquisitions — Paris, Musée d’Orsay — A few months ago (see news item of 21/5/08), we had presented the latest Symbolist acquisitions made by the Musée d’Orsay. The following completes this annotated compilation of the purchases, bequests or donations over the last two years of Serge Lemoine’s term. A few of Edgar Degas’s mythological paintings from his early career are known. 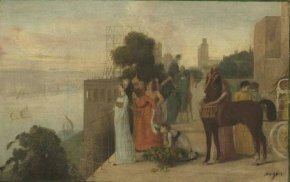 Orsay owns the most famous one, Semiramis building Babylon, which the artist kept in his workshop his whole life, as well as a preliminary pastel. In 2007, the museum acquired at Sotheby’s London, another study for this same composition in oil on paper (ill. 1) for 120,000 € (including charges) which presents several differences with the completed work. The Portrait of the Marquis and the Marchioness of Miramon by James Tissot (ill. 1) is a major masterpiece which deserved a news item to itself when it entered the museum in 2006, until which date it had remained in the model’s family. Commissioned in 1865, this painting reflects the relative importance of hierarchies and classifications. James Tissot has been underrated for a very long time and if the art market as well as art lovers have fully reinstated him today, the general public is still largely unaware of his talent. This work is however on a par with canvases by Claude Monet and Frédéric Bazille done at the same time. 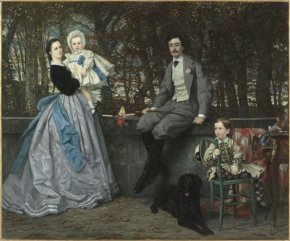 At the Musée d’Orsay, the visitor can easily compare it for example with Women in the Garden (around 1866) or Déjeuner sur l’herbe (1865-1866) by the first or with Family Reunion (1867) by the second. All of these works reveal the same metallic light, the same attention to the texture of the garments, the same search for spontaneity. Although one already glimpses in Monet the dissolving of the stroke which Tissot would never practice, the latter’s attempts at innovation, before the war of 1870, were close to those of the future Impressionists. He would then follow a different path. A large drawing in pastel, charcoal and gouache by Dagnan-Bouveret was purchased in 2006 (ill. 3) from the Vincent Lécuyer Gallery in Paris . 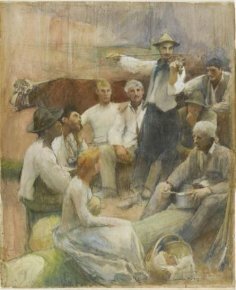 This is a preliminary study for a painting presented at the Salon National des Beaux-Arts in 1893 and placed on deposit by Orsay at the Musée des Beaux-Arts de Nancy, representing a group of peasants stopping their work to listen to one of the others play the violin. The artist thus elevates the genre scene and instills it with an almost mystical sense. The Naturalist art of this painter from Nancy, Emile Friant, who was a student of Cabanel, is close to that of Bastien-Lepage or Dagnan-Bouveret, as seen in, for example All Saints’ Day at the Musée des Beaux-Arts de Nancy . 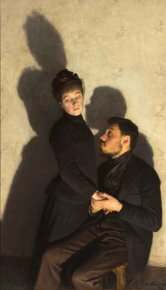 The work acquired by Orsay in 2007 from the New York art dealer French & Company , Cast Shadows (ill. 4) has a strange and seductive quality which is felt instantly and which undoubtedly makes it one of the artist’s best. The way in which the shadows fall on the wall, probably a reference to the episode recounting the invention of drawing , makes it unfold into a double scene. There is practically no colour here, and it is limited to nuances of beige which serve to accent the fantastic aspect of an otherwise everyday phenomenon. Several influences can be seen here, from Degas to the Nabis. This is one of those paintings that once again breaks the traditional mould. In his review of Félix Vallotton’s catalogue raisonné (on La Tribune de l’Art, in French), Olivier Bonfait showed a Self-Portrait from 1897 (ill. 5) which was then part of a private collection. This painting was acquired by Orsay in 2007, thus enriching the works by this artist, many of which entered the collections in the last few years : Interior, Woman in Blue Rummaging in a Wardrobe in 1997, Misia at her Dressing Table (see news item, in French, of 6/02/04) in 2004 and Portrait of Natanson in 2005. Also acquired in 2006 were a donation of the Portrait of Karin by Othon Friesz, from 1939, later than the chronological limits, theoretically, of the Musée d’Orsay (and those of The Art Tribune), an extraordinary painting by André Devambez, dated 1910, The only Bird Flying above the Clouds donated by the Société des Amis du Musée and the bequest, Portrait of the Halévy Family by Jacques-Emile Blanche. For legal reasons (these works do not fall in the public domain), we will simply refer the reader to the pictures on the Musée d’Orsay’s website or that of the RMN. It would be almost impossible to offer a complete list of works acquired by Orsay as, besides the paintings, drawings and sculptures we mention here, we would also have to include the dozens of decorative art pieces and photographs which enter its collections every year. In 2006, the museum acquired a major holding of proofs on albumenized paper by André-Adolphe-Eugène Disdéri from the Parisian bookdealer Serge Plantureux . 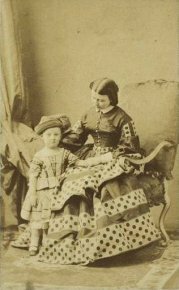 These include, besides portraits of well-known personalities (the Imperial Prince, Napoleon III...) or unknown figures (ill. 6) , many photographs of paintings and sculptures taken during the Salon de 1855. Other than just their aesthetic qualities, these photos hold a documentary interest for art historians. A large portion of the reproductions can be seen on the Musée d’Orsay website , and some of them are easy to identify, such as the Painting representing the scene of a Christian martyr which is in fact The Martyrdom of Saint Cyr and Saint Juliette, his Mother by François-Joseph Heim (Paris, Church Saint-Gervais-Saint-Protais). Let us note that another photographic collection, by the Nabis painter Maurice Denis, entered the Orsay collections in 2007, donated by the artist’s heirs while twenty-seven sketchbooks of drawings and sketches by him were purchased by the museum. We would like to end this article with two works in relief which could have been included in the previous article devoted to Symbolism. 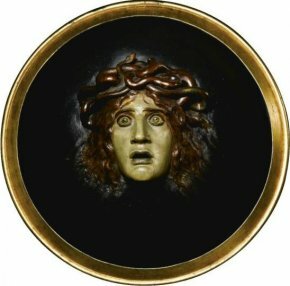 The first is a sculpture in papier mâché by Arnold Böcklin representing Perseus’ shield with the Head of Medusa (ill. 7) acquired at Sotheby’s London on 12 June 2006 for 62,000 € (without charges). The artist, working with the help of his son-in-law Peter Bruckmann, made several copies . 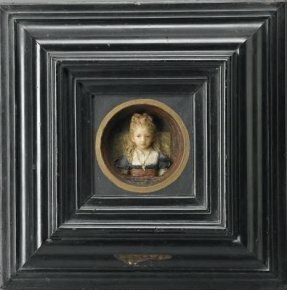 The second, also a figure in a medallion (ill. 8), but of wax and very small, is by Henri Cros who specialized in coloured sculptures executed in this material. Alexandre Dumas, son, had commissioned this portrait of his daughter Jeanine, then eight, directly from the artist. The work came up for auction in Berlin (Reiner Dannenberg Auktionshaus) on 3 December 2005. Orsay owns a small signed copy which looks like a study. Who had bought it on 25 October 2005 at Sotheby’s New York. As noted correctly by Dominique Lobstein in his entry for the painting which appeared in 48/14 La Revue du Musée d’Orsay, Spring 2008, p. 52-53 and who links it to Suvée’s canvas a century earlier. Orsay already owned several thousand works by this photographer. It would be highly useful to compare this type of photographic portrait to those by Tissot, Bazille and Monet mentioned at the beginning of this article and dating from the same decade. After entering “further search”, type Disdéri and 2006 in the field “year of acquisition”. Sotheby’s London had sold another one on 12 June 2006 for a similar price (65, 000 £ before charges).